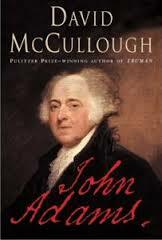 Here is a superb presidential biography by master writer David McCullough. Mr. McCullough could not be dull if he tried and this is one of his most popular books. This volume brought him his second Pulitzer Prize and I can see why. This biography has the distinction of rescuing a stalwart founding father from the oblivion he was sinking into. It was an undeserved retreat, which McCullough likely realized, and Adams has a 200-year history of competing with Jefferson and coming up a little short. It took McCullough to put Jefferson on the defense! McCullough did not create something from nothing. Adams is the real deal. He is no Washington, but who is? He need not feel inferior to any other of our Founders. Perhaps a better Founder than a President, but he did as well as any one could following Washington. He had a few blunders, but some successes too. He could be quite crusty, but he had an honest foundation that never let him down. He was far more moral in his private life than Jefferson. He was not into intrigue or political maneuvers, even to the detriment of his career, but I found myself appreciating it as I read. He wouldn’t just lie when he hit a rough spot either. That it is not to say he didn’t have his flaws. Vanity, and at times ambition, damaged his career. In his defense he realized it to some degree and even made a few attempts to improve. This volume does a particularly good job at tracing the ups and downs of his relationship with Jefferson. As you read, you will actually rejoice to see the two improve the relationship in old age. This volume also well explains that the seeds of the Civil War were sown at the very beginning. Adams hated slavery. It is clear too that Adams was a believing Christian. He is not one of the Founders like Jefferson or Franklin who can be put in the Deist camp. Seeing him as a father was instructive too. Two of his children did not turn out well and his neglect was probably a contributing factor. He put much more input into John Quincy Adams’ life to better results. This book is simply one of the great ones.